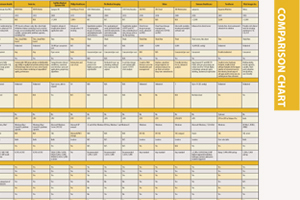 This article originally was published as an introduction to the picture archiving and communication system (PACS) comparison chart, and can be viewed here. The concept of picture archiving and communication systems (PACS) has been part of radiology since the early 1970s. The technology has provided a way to hold and view large volumes of medical imaging data as radiology has transitioned away from analog image acquisition. In recent years, however, the rise of enterprise imaging has changed the role of PACS, and providers are looking for new, modern solutions, according to a 2017 report from independent research firm KLAS. Surveying thousands of healthcare professionals, the report found that performance from historically popular PACS vendors has declined, and newer market players have begun to set themselves apart. Sectra and Carestream had the highest overall score among large hospitals. Infinitt and McKesson were the top performers among community hospitals, and Sectra and Infinitt had the highest scores among imaging centers. Ease of use and the utility of technology upgrades were frequently mentioned as either strengths or weaknesses of the vendors. Respondents spoke most highly of vendors whose products easily integrated with their other systems, including electronic medical records (EMR). Some smaller community hospitals and imaging centers reported products from the larger vendors were overly complicated for their needs, reflecting a need for scalable solutions. Healthcare reform in the last decade has sought to make care more efficient, urging providers to consolidate and make better use of existing resources. In radiology, this combined with the widespread adoption of electronic medical records (EMRs) to create a need to access medical imaging across the hospital — giving birth to the concept of enterprise imaging. Healthcare enterprises themselves have morphed as well, with larger hospital systems acquiring smaller ones or merging with others. A 2017 report from U.K.-based Signify Research predicts that enterprise imaging revenue will more than double globally over the next five years. “As health systems consolidate, vendors who have primarily catered to imaging centers and small hospitals will need to expand into larger organizations to be viewed as strategic options,” said report co-authors Eder Lagemann and Alex McIntosh. According to the KLAS report, customer satisfaction with PACS vendors overall has continued to decline across healthcare, leaving provider organizations with few options. Vendors that have seen increased interest in recent years have been those with more focus on an enterprise imaging approach as opposed to the old single-department/single-hospital PACS model. This appeared particularly important to large hospitals, who made up 45 percent of all survey respondents. • The joining of McKesson with Change Healthcare Holdings to create Change Healthcare in March 2017. Some providers have noted a dip in service quality following these changes, but many are hopeful for a return to previous levels of service. ITN cxreated a comparison chart of PACS systems available on the U.S. market at www.itnonline.com/chart/pacs-systems. It requires a login, biut it is free and only takes a minute.